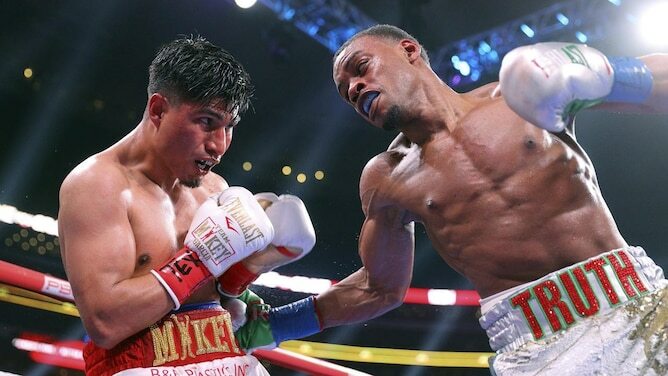 WBC lightweight champion Mikey Garcia 39-1 (30) has praised IBF welterweight boss Errol Spence Jr 25-0 (21) in the wake of his first professional loss at the AT&T Stadium in Arlington, Texas on Saturday night. Garcia lost a 12-round unanimous decision by scores of 120-107, 120-108 and 120-108. Punch statistics had Spence outlanding Garcia by more than 4.5 to 1. The 31-year-old Garcia of Riverside by way of Oxnard, California remained upbeat after the fight despite the 36-minute drubbing. Garcia was attempting to win a world title in his fifth weight class after previously claiming championship honours from featherweight through to junior welterweight but Spence ultimately proved too big, too powerful, too smart – and just too good. “He showed great boxing and had great power. I wasn’t hurt at any point. I took some good shots, it’s boxing,” Garcia said. Promoter Richard Schaefer praised Garcia for his toughness to survive the 12-round beating on his feet. “Man the guy showed balls. He tried and came up short. He dared to be great. Tonight it didn’t go his way and he will be back,” Schaefer said. A move back down in weight is imminent with Garcia planning to sit down with his brother and trainer Roberto Garcia and his father Eduardo Garcia to map out his next move.